BLITZER: Could you imagine if you were president—we’re almost out of time—and there was one American soldier who had been held for years, and the demand was Al Qaeda or some other terrorist group, you have got to free everyone at Guantanamo Bay, several hundred prisoners at Guantanamo? Could you see yourself, as president, authorizing that kind of transfer? CAIN: I could see myself authorizing that kind of transfer, but what I would do is, I would make sure that I got all of the information, I got all of the input, considered all of the options. And then the president has to be the president and make a judgment call. I could make that call if I had to. This was a pretty disastrous answer, and not an entirely hypothetical possibility: US Army Sergeant Bowe Bergdahl has been held by the Afghan Taliban since 2009. Despite the fact that few of the remaining detainees at Gitmo have even had a trial, let alone been convicted of a crime, much of the country regards them all as guilty as a result of a decade of politicians asserting without qualification that they’re all guilty. That’s part of why Obama couldn’t close Gitmo even when there was a Democratic majority in Congress. Cain tried to explain away this answer in last night’s debate. CAIN: The rest of the statement was quite simply, you would have to consider the entire situation. But let me say this first, I would have a policy that we do not negotiate with terrorists. We have to lay that principle down first. Now being that you have to look at each individual situation and consider all the facts. The point that I made about this particular situation is that I’m sure Prime Minister Benjamin Netanyahu had to consider a lot of things before he made that. So on the surface, I don’t think we can say he did the right thing or not. A responsible decision-maker would have considered everything. COOPER: But you’re saying you could—I mean, in your words, you’ve said that I could see myself authorizing that kind of a transfer. Isn’t that negotiating with, in this case, Al Qaeda? 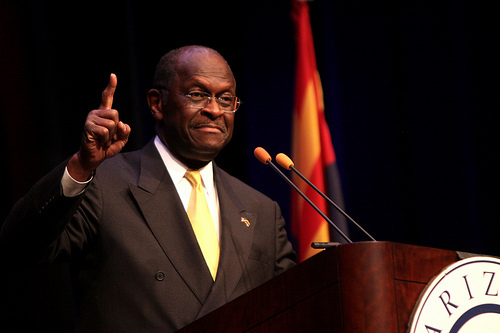 CAIN: I don’t recall him saying that it was Al Qaeda-related. Again, a disastrous answer—not only did Blitzer specifically ask about Al Qaeda, but Republicans have spent the last few years opposing the transfer of detainees to US federal court for trial, let alone their outright release. The idea of an American president negotiating for hostages isn’t entirely inconceivable—as Marcy Wheeler writes, Ron Paul pointed out last night that Ronald Reagan sold arms to Iran in exchange for the release of American hostages. But given the politics of Gitmo, particularly on the right, Cain’s answer was about as gaffe-tastic as it gets. Cain’s problems are essentially two-fold here. One, he knows almost nothing about foreign policy, let alone the domestic politics of Israel and the reason why Netanyahu could make such a decision. Shalit became such a potent symbol to Israelis in large part because Israel has compulsory service, which means that Shalit could literally be anyone’s child, anyone’s sibling, anyone’s parent. Things are different in the United States, where the burden of our incessant wars is borne by a relatively small part of the population, and military service is much more of an abstract concept. The second is that Cain was obviously snowed by the preface of the question, “did Binyamin Netanyahu do the right thing.” It’s not accurate to say the GOP respects Netanyahu more than the man currently in the White House, it’s more like they regard him with a combination of awe and reverence. When Netayahu visited Congress in May the GOP treated him like he was a hybrid of Winston Churchill and Ronald Reagan. Cain was operating off a simple principle that, in this particular case, failed him: Everything Israel does is beyond criticism, and everything Netanyahu does is awesome. Had the issue been something other than negotiating with Hamas for the release of prisoners, Cain probably would have been okay.